Detailing the physical features, habits, territorial reach and other identifying qualities of the Northern Paper Wasp. The very social Northern Paper Wasp can make a nest in unusual and unexpected places, requiring only a bit of wood of get started. 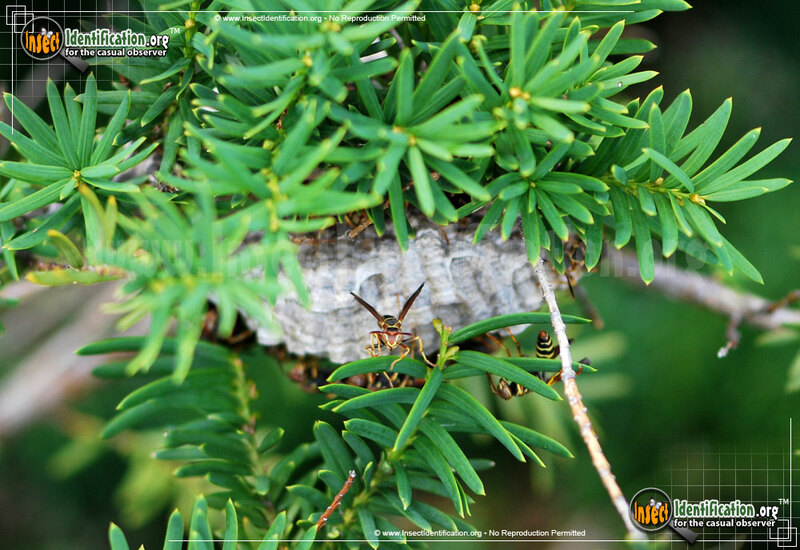 Northern Paper Wasps are most commonly found in the Midwest states. They are likely to build nests near humans as that is where a lot of wood can be found (homes, barns, sheds, fences, firewood, landscaping, etc.). 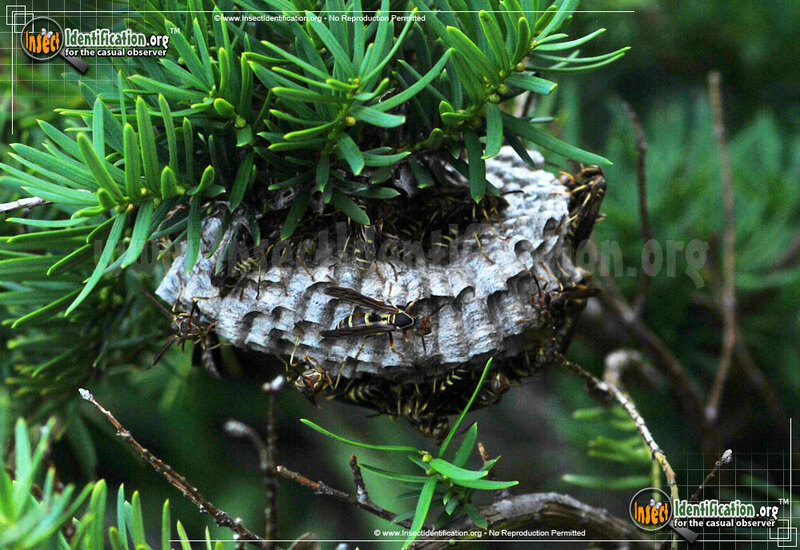 The wasps use wood to create their nest. They chew the wood, mixing it with saliva to make a paste. This paste is formed into a nest that has the texture and appearance of paper. Paper Wasps are a very social type of wasp. They rely on each other for food, shelter creation, and protection. A study was done to see what role facial recognition plays in the socialization of this species. 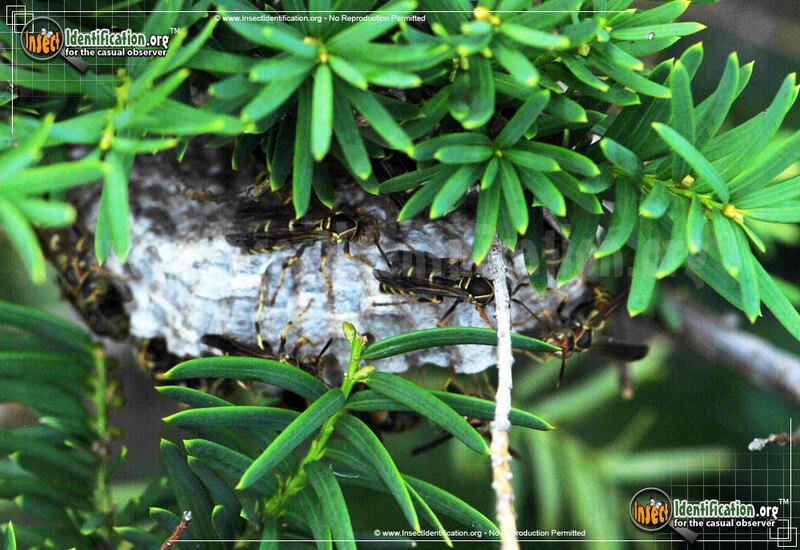 Northern Paper Wasps can tell the difference between their own species and other wasps in the same genus (cousins). They become physically aggressive toward outsiders and attack them to protect their nest. 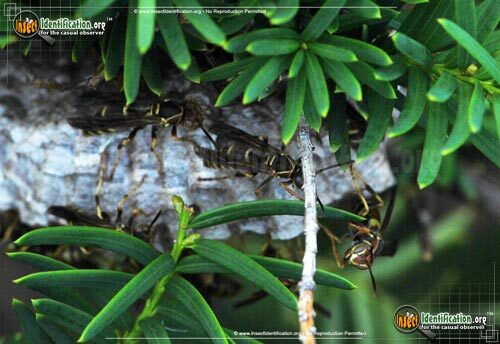 It was a novel discovery for an insect species. This particular species of paper wasp contains multiple fertile females for a short time, though one queen dominates all of them. She hatches just before winter and quickly mates with males before hibernating. In the spring, she establishes her nest by laying her eggs. Most of these are workers that are sterile. 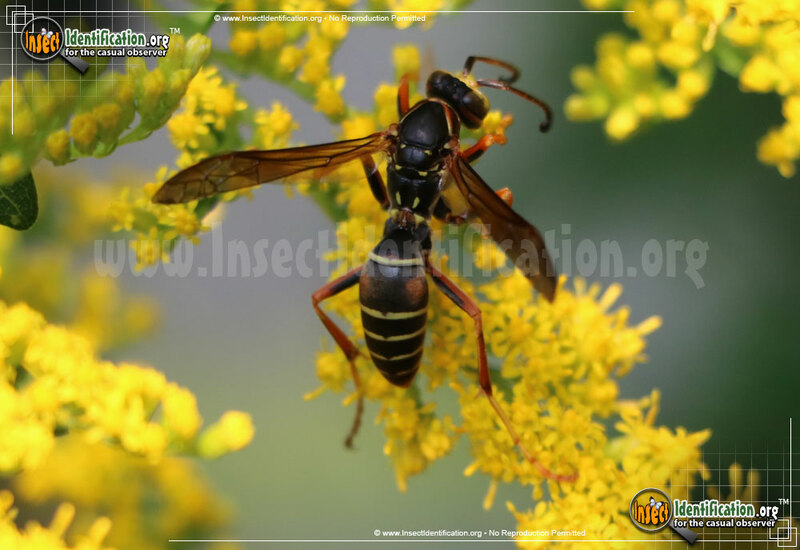 Fertile females and males are usually born in late summer and mate before they overwinter and establish their own nests the next spring. Once these fertile females hatch, though, they quickly come to understand their position in the social ranking. The primary queen eats any eggs that are not her own. She tells them apart by using a chemical to 'tag' her own eggs and she avoids destroying them. In this way, she quashes any attempts to usurp her authority while she is still living. She, her workers, and any males do not survive past autumn. 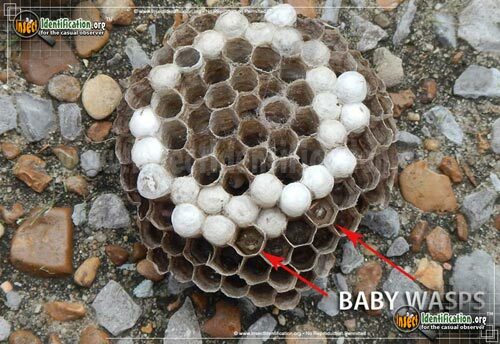 People and animals that disturb a nest may be stung multiple times by a single wasp because, unlike bees, do not die after one sting. Their stinger is smooth and is easily removed from skin without remaining embedded. The primary queen is first to aggressively defend her nest and her oldest workers will join her in that effort. 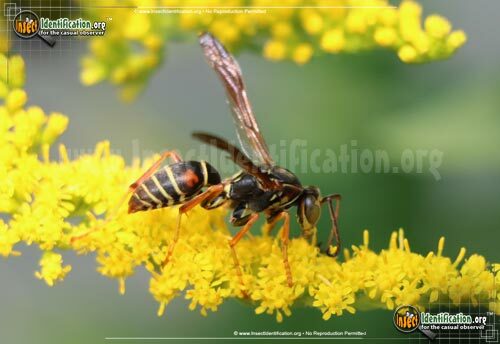 Northern Paper Wasps actually do a great job of removing plant-devouring caterpillars from gardens. The adults eat them and will also use them to feed to their larvae when they hatch. 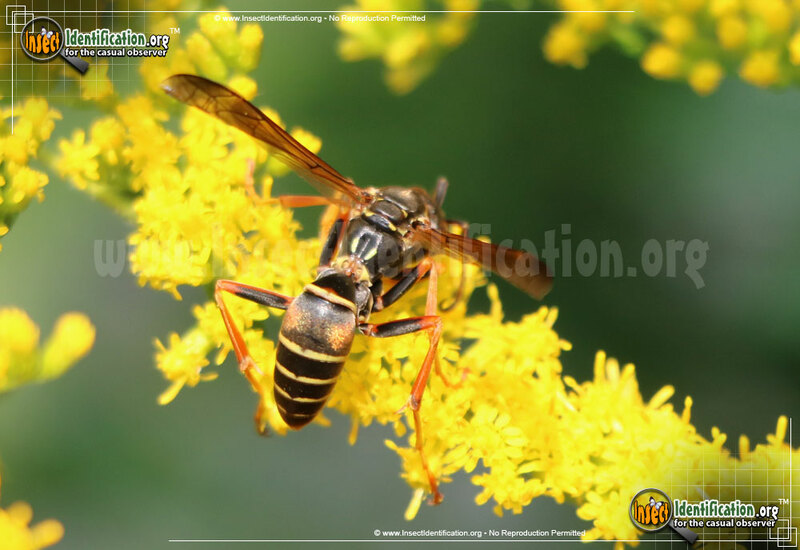 Northern Paper Wasps are so effective at this pest control that they are almost welcome in organic gardens since their presence negates the need for chemical pesticides.